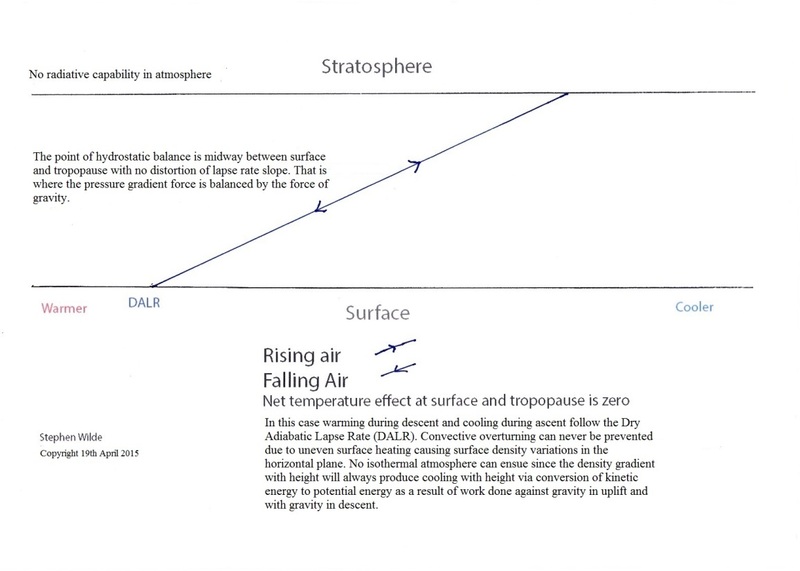 If tropopause height is raised by upward convection by the force of rising air from below then it must descend at some other location where the force of uplift is absent or less strong. Thus tropopause height will always be irregular and fluctuating up and down from place to place. Uneven surface heating causing density variations in the horizontal plane makes convective overturning unavoidable with or without GHGs. Rising air has enough kinetic energy (KE) to overcome the downward force of gravity which seeks to both pull down and compress gases. That downward force can conveniently be represented by the quantity of potential energy (PE) held by atmospheric molecules suspended off the surface. It follows that descending air does not have sufficient KE to overcome the downward force of gravity. PE can then be said to exceed KE. At the surface, molecules contain only KE and as height is gained PE takes over from KE because as molecules rise into regions of lower density they move further apart and vibrate less. Kinetic energy (heat) is transformed into potential energy which is not heat and does not radiate. 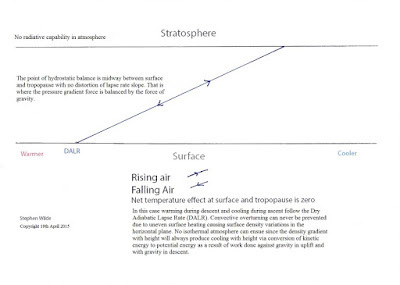 For Earth’s troposphere, molecules involved in convection can only rise as far as the tropopause because at that level there is an inversion layer containing warmer, lighter air. Colder, denser air, being heavier, will always remain at a lower height than warmer, lighter air. 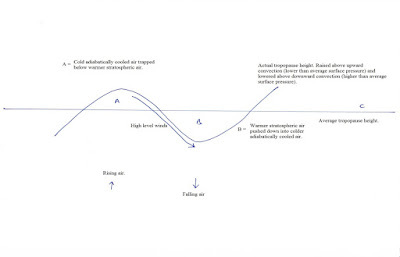 The coldest air is found at the top of section A having been cooled by adiabatic ascent and held at that height by warmer lighter air pushing up from below. If convection is enhanced by GHGs absorbing IR from the ground then that will tend to push convection higher than if there are no GHGs and produce more upward distortion of tropopause height above ascending columns. Section A becomes larger as does section B. Section A is then storing more PE than before and, as long as non-condensing GHGs remain present in an atmosphere, that greater energy storage facility in section A is permanent. More GHGs leads to more energy storage in section A.
PE is not heat and does not radiate. Since warmer, lighter air continues to move upwards beneath it, that cold air at the top of section A is forced to displace sideways but being colder, denser and heavier air than the air in section B (and beneath section B) it will be forced downwards as shown above . Due to the Coriolis force it circles around in high level winds from the top of a low pressure cell containing ascending cooling air towards the nearest high pressure cell containing descending warming air, descending and warming adiabatically as it does so. The important point to note is that due to the temperature and pressure gradient within the troposphere the surroundings will warm and become denser at the same rate as the descending cold air from the top of section A warms and compresses. The consequence is that the density and temperature difference between the descending air and its surroundings will be maintained all the way to the surface or until an inversion layer is encountered. 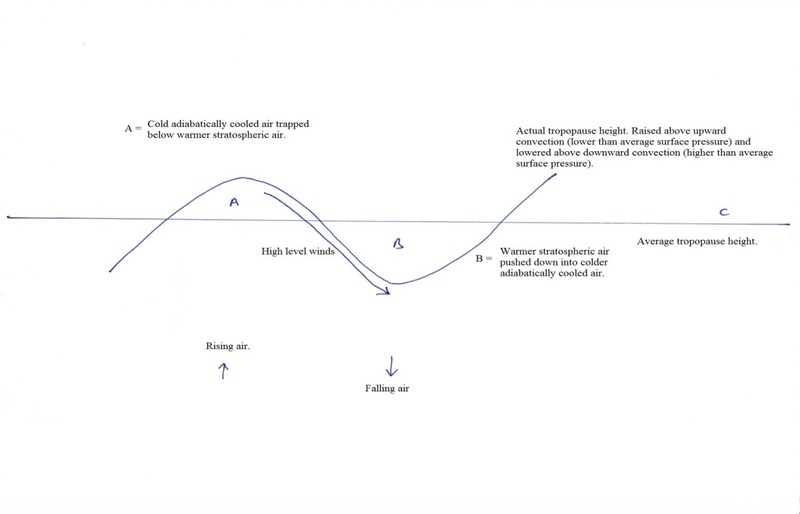 The descending column is therefore colder than it would have been if descending from a lower height in an atmosphere with no GHGs. The lapse rate slope in the descending column is distorted to the colder side of the DALR. Air being a poor conductor we can ignore conduction in and out of the descending parcel of air for present purposes. So, just as KE was greater than PE throughout the column of ascending air then PE is greater than KE throughout the column of descending air. This is a simplified diagram that should be considered in conjunction with the top diagram that shows how the tropopause behaves when rising air starts to descend. We can see that, above the height of hydrostatic balance, radiation to space from GHGs steadily increases the KE deficit in the descending column so that the lapse rate slope diverges further and further from the DALR until the point of hydrostatic balance is reached. Below that point KE starts being added via radiative absorption from the ground by the GHGs in the descending column which slowly warms to the surface temperature it would have attained with no GHGs present. The CO2 emissions gap at the top of the atmosphere as viewed from space is caused by the absorption of IR from the surface in both ascending and descending columns below the height of hydrostatic balance. Due to the additional storage of KE as PE in the expanded section A at the top of the atmosphere the surface temperature need not rise. The distortion of the lapse rate slope to the warm side in the ascending column is enough to provoke enhanced uplift without the surface needing to be warmer. AGW theory mistakenly relies on the lapse rate not being distorted so that the surface temperature needs to be higher to enhance convection. 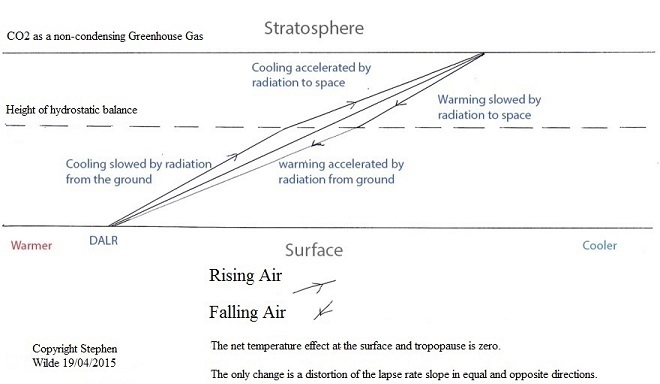 At the bottom of the descending column, surface temperature rises above the temperature predicted by radiative physics via the so called S-B equation with or without GHGs because the descending air is inhibiting upward convection, just like a greenhouse. That is why sunny deserts beneath semi-permanent descending high pressure cells get hot in the daytime. It then takes time for surface winds to transfer the excess surface energy to the nearest region of convective uplift and it is that delay averaged globally that raises surface temperature 33K above S-B whether GHGs are present or not. That process is a consequence of atmospheric mass absorbing insolation from the heated surface by conduction and convection and not downward radiation from greenhouse gases as proposed by AGW theory. Any downward radiation towards the surface alters the local hydrostatic pressure at height between the surface and the absorbing GHG molecule which conducts KE to adjoining non GHG molecules putting the local pressure gradient force out of balance with the gravitational force so that the warmed molecules rise spontaneously due to their lower density. 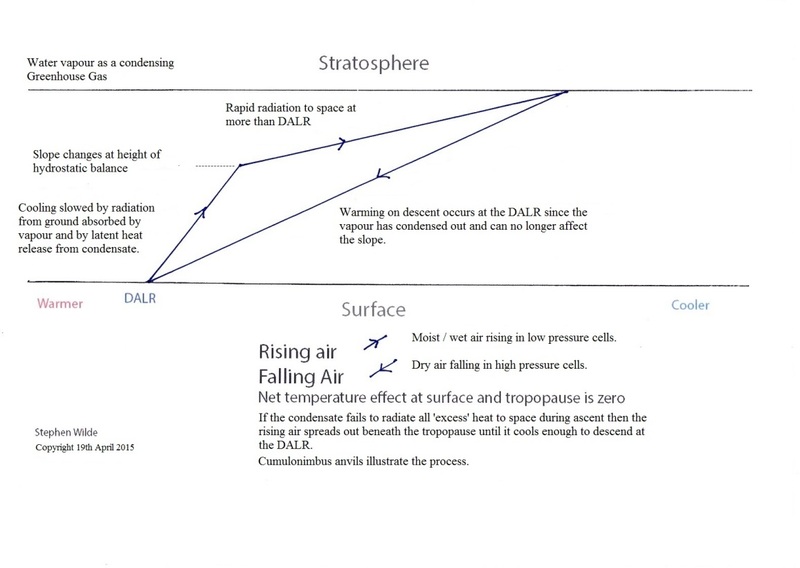 In the process of rising they cool by decompression but whilst rising they remain warmer than they should be for their position along the DALR because their surroundings cool at the same rate as they ascend adiabatically. That is where the DALR distortion to the warm side comes from and that is what enhances upward convection rather than any surface warming. 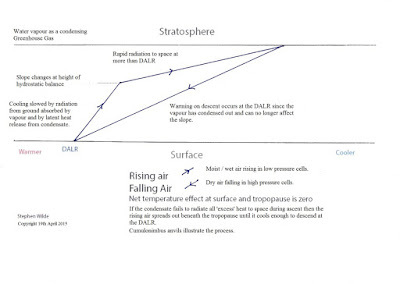 Exactly the opposite occurs in the descending column (all the molecules are cooler than they should be for their position along the DALR because the GHGs have caused the ascending column to rise to a higher colder location and KE has been taken out and stored permanently in section A so that it is no longer available for recovery at the surface in convective descent. In the above diagram Section A represents the sum total of the tops of all ascending columns around the globe. As some dissipate they are replaced by others so the average global volume of all sections A remains the same. The net thermal effect from the GHGs is zero when the two columns are averaged which is why the diagram shows the lines all converging at the same local temperature at both surface and tropopause. GHGs cause section A in the above diagram to be higher and colder (with more PE) than it otherwise would be. The only KE which is recovered from PE during the subsequent descent and then radiated out from the surface is that which is not stored permanently in the expanded Sections A i.e. the original quantity for a GHG free atmosphere. A GHG such as CO2 blocks certain wavelengths from escaping the atmosphere to space but since the convective adjustment returns kinetic energy back towards the surface the blocked wavelengths are simply reconverted to the whole range of wavelengths again at the surface. The wavelength changes when that KE returns to the surface for another chance at upward emission to space ensure that the blocking effect of the GHGs is overcome by more radiation escaping to space directly from the surface otherwise the sections A would keep expanding indefinitely. Note that here we are discussing only two radiatively active ‘pipes’ for the exit of radiative energy to space, namely GHGs within the atmosphere and the surface. For a more complex atmosphere with other types of radiatively active material such as other GHGs, water vapour condensate and inorganic or organic particulates then the other ‘pipes’ will also be active and take over more of the compensating radiation to space. This scenario would involve ALL radiation escaping directly to space from the surface when there is no radiative capability in the atmosphere. There is inevitably still convective overturning and no isothermal atmosphere even in that situation. Every atmosphere has a decline in density and temperature with height as long as it is held off the ground against the force of gravity in hydrostatic balance. All mass has some radiative capability, even oxygen and nitrogen and there will always be aerosols and particulates so the above diagram is an idealised one. In reality there would always be some distortion of the DALR in both ascent and descent. There will be condensate in the form of clouds at various heights in this case and such condensate radiates readily to space depending on height and density hence the faster decline in temperature with height above the point of hydrostatic balance. Because of the wide variability of cloud types, heights and densities the height of the point of hydrostatic balance varies constantly within rising columns of air containing water vapour. So, whatever is the atmospheric composition the only factors that influence surface temperature are the strength of the gravitational field, the mass of the atmosphere and the strength of incoming insolation. The infinitely variable lapse rate structure available in three dimensions around a rotating sphere stabilises any thermal effects from everything else by causing variable convection which leads to variations in tropopause height so as to deposit surplus KE into the atmospheric PE reservoir or draw it out as necessary to maintain stability. In the process there are changes in the balance of radiation escaping to space from each of any available ‘pipes’ and if there are none other than the surface then the surface alone it will be. I've noticed an error with the third diagram. It will be corrected shortly. Thanks to MS for publishing this and I hope it receives constructive attention within the climate blogosphere. The tropospheric vertical temperature lapse rate is primary, and predominant over all other processes in the atmosphere (including night and day). Everyone should know it is predominant because of my 2010 Venus/Earth temperatures comparison, but even without that definitive evidence, it is evident from the temperature and pressure profiles of the other planets, in that they all show the same tropospheric lapse rate structure, from approximately 200 mb pressure on up in every case (that is to say, the 200 mb level and deeper in each atmosphere), differing only in the specific lapse rate for each planet. The hydrostatic lapse rate (which is my term; everyone else before me called it the adiabatic lapse rate, and generally still do--and steadfastly refuse to listen to me) has the form (-g/c), which should tell you it does not depend upon convection. The hydrostatic condition is described most simply as "the pressure at any level is due to the weight of the atmosphere above that level"; it is called hydrostatic because that is the condition pertaining in a still ("static") column or reservoir of water, which is incompressible (so right away, the marvel is that even in a compressible gaseous atmosphere, above 200 mb pressure the condition still holds--as my Venus/Earth confirmation of the Standard Atmosphere, which is defined by the hydrostatic condition, again makes quite clear). The point is that the hydrostatic lapse rate, or vertical distribution of temperature, depends only upon the vertical distribution of pressure. As such, it fundamentally requires only local conduction between successive pressure levels to maintain it. Convection can only be an effect of the fundamental lapse rate structure, not a cause for it. This has traditionally been encapsulated in the old saying, "hot air rises" (hot air does not cause itself to rise, i.e. convect, the lapse rate structure--the temperature gradient--does that). Hi Harry, the water in the pool does not cause itself to rise either. It's the rock thrown in the pool that did that. Nothing to do with temperature. All to do with density. The decline in density with height is the key. The greater the density at the surface the more insolation is taken up by conduction and convection and the more of that absorbed energy can be shuffled up and down in convective overturning along the lapse rate slope. Note that the 'hydro' in hydrostatic does not mean water but fluid. I prefer to say that the hydrostatic condition of the atmosphere gives rise to an adiabatic lapse rate which follows the fall in density and pressure with height. Density is the key because the greater the density the more conduction goes on at the expense of the emission of photons. All one needs for convection to occur is uneven surface heating leading to density variations in the horizontal plane so that GHGs are not required. So you say that GHG, in net,don't warm. But this is a different argument than the people who say that the colder atmosphere can't warm a warmer surface because of the Second law of thermodynamics. Right? It is a different argument, but both are correct. Even the warmist "experts" agree with skeptics that "back-radiation" from GHGs cannot warm the surface due to 2nd Law. They (falsely) claim the ERL moves up, CO2 allegedly radiates at a colder temperature, thereby warming the whole atmosphere. This is also complexly false. Yo Stephen, Harry. Its a chicken or the egg concept. Both interpretations seem to be very much on the right track. I do however think that Harry may be more correct in that convection could not take place with there being a temperature/pressure gradient in the first place. My take is that the temperature/pressure gradient allows the atmosphere to retain only so much energy at a particular temperature/pressure point. Trouble is, how to get the MSM and the climate agenda to realise that they have made one massive awful mistake in thinking that CO2 has much to do with it except as a conduit for radiative energy transfer. "Trouble is, how to get the MSM and the climate agenda to realise that they have made one massive awful mistake in thinking that CO2 has much to do with it except as a conduit for radiative energy transfer." Amen. They've gotten the basic physics backward and have confused the cause with the effect! My article takes it as read that atmospheric mass held within a gravitational field develops a decline in density with height and that decline in density cvauses the temperature/pressure gradient. It follows that of course the lapse rate slope is the enabler of convection because lighter parcels of air at the surface encounter decreasing weight above as they rise so that in rising they can cool adiabatically at the same rate as the surrounding molecules cool along that lapse rate slope. The temperature/pressure gradient being a consequence of atmospheric mass and gravity working together above a surface subjected to insolation does indeed cause the atmosphere to be capable of holding on to only a specific proportion of the insolation energy passing through. That proportion is made up of KE plus PE (total internal energy) and radiative gases cannot change it by virtue of the mechanism I describe above. i was always told a good scientist could explain a theory clearly to anyone with a basic education. i believe i have just had a theory explained clearly to me by a good scientist. thank you very much for your efforts stephen, i have a feeling they will become increasingly appreciated. That's a relief. I sometimes feel that I'm trying to push rocks uphill. could this effect be detected by satellite stephen ? It is detected by millions of observations from radiosonde weather balloons, satellites, aircraft flights, rocket flights... e.g. the 1976 US Std Atmosphere mathematical model is based upon these same basic atmospheric principles and was then verified with millions of observations. thank you ms. i will go and do some reading. it is good to see people are working on alternatives to the current dogma.